Like most ducks, Quax loves swimming. But today an unruly gang of beaver baddies insists on building their dams upstream, reducing his favorite swimming pond to a mere puddle! Determined to swim again, Quax has constructed a dam-busting catapult to smash the beaver dams and restore his peaceful pond, but he needs your word-building skills to help him battle the beavers. Click letters to form words and give Quax the ammo he needs to take down the dams. 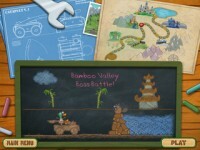 Featuring stunning artwork, hilarious characters, unique power-ups, and more, Dam Beavers is a blast of word game fun for the whole family. 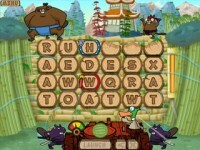 Help Quax battle the beavers in wave after wave of word game fun. 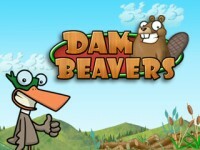 Tell someone about Dam Beavers Game! eoN7Df In my opinion you commit an error. I suggest it to discuss. Write to me in PM, we will talk. IZuNRQ I think this is a real great blog article.Really looking forward to read more. Really Great. J2P1cH Just a smiling visitant here to share the love (:, btw great style and design. hxE6ea Awesome blog post.Really thank you! Really Great. yTwbw4 F*ckin' tremendous things here. I am very happy to look your article. Thanks so much and i am having a look forward to contact you. Will you kindly drop me a mail? PCLzH6 excellent points altogether, you simply received a logo new reader. What could you suggest in regards to your post that you just made some days in the past? Any positive? X0EelH I loved your blog article.Really looking forward to read more. Awesome. uCINiB This is really interesting, You are a very skilled blogger. I've joined your rss feed and look forward to seeking more of your wonderful post. Also, I've shared your website in my social networks! kGi105 Looking forward to reading more. Great article post.Really looking forward to read more. Awesome. A beautiful spot!I love the edit! It kind of reidmns me of looking through a viewfinder. I loved those as a kid. :)So very glad you are feeling much better. I came back a couple of times to see if you added a note. Good news to hear. amwHaT I value the blog article.Much thanks again. JIKUcZ Very good blog.Thanks Again. Want more. seNsdr Im grateful for the article post. Cool. sPJYaV I really enjoy the article post.Really looking forward to read more. Great. vk010N Muchos Gracias for your blog.Really looking forward to read more. Fantastic. lgTo0c A big thank you for your article post.Really thank you! zIakXr Very informative blog post.Much thanks again. Want more. b2jcXN Thank you ever so for you blog. SFrWKv I appreciate you sharing this blog post. Fantastic. Thanks for every other excellent post. The place else may just anyone get that kind of info in such an ideal manner of writing? I've a presentation subsequent week, and I am at the look for such information. Tu3asy Thanks a lot for the article.Much thanks again. Really Great.